Modded iPhone Box – 2009 | JONAH BRUCKER-COHEN, PH.D. Modded iPhone Box – 2009 – JONAH BRUCKER-COHEN, PH.D.
iPhone packaging modded into a project box. 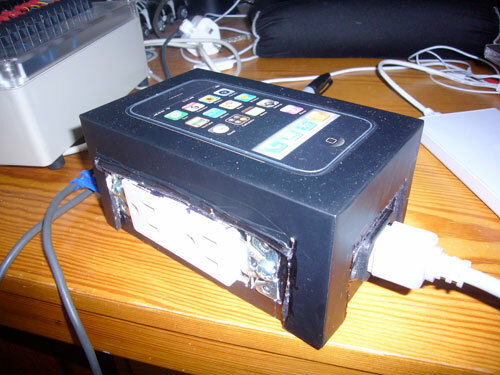 I built this “Modded iPhone Box” to use as a project box for my project, Alerting Infrastructure. The case was cut along the top and side to accomodate an AC Outlet and a USB port for and Arduino inside with a protoshield. The “Modded iPhone Case” was a simple act of recycling the strudy packaging of Apple’s iPhone into a project box for another project of mine in order to recycle one object to use for another project.